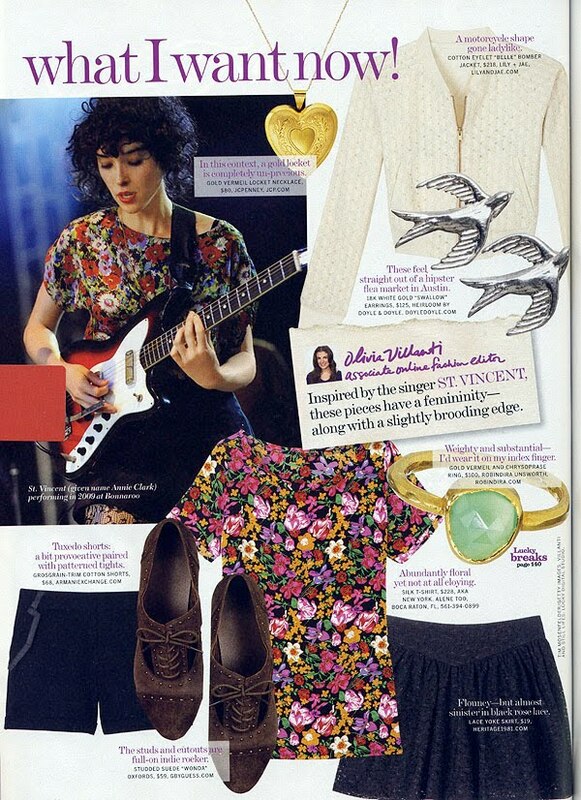 A year ago I flipped through an issue of Lucky Magazine and spotted an adorable outfit inspired by the singer/songwriter St. Vincent. I fell in love with the look, and especially the cute cutout oxfords - so much that I wanted to go and buy them that instant. They weren't available at the time, and after months of waiting, finally appeared in black (no brown ever existed). So I got them in December, but I hadn't forgotten about this outfit. At long last... does it live up to my expectations and a year of anticipation? 1. Your shoes are amazing. 2. I like the inspiration page from Lucky, too. So not my style, but so freaking adorable. 3. Speaking of adorable, I like your dog. 4. I like you, too. 5. And I LOL'ed at your title, because I am awesome. You are the best clothes- stalker ever! Wish I had that much dedication. But it was so worth it looking at these shots. I love seeing your inspiration! hehehe you're awesome, I can't wait that long for an outfit, usually I forget about it! Those are so cute! I scored a great pair of oxfords at Goodwill this afternoon but I love the little cut out details on yours. And I love the bird necklace that you're wearing as well. Cutout oxfords are awesome, I've been eyeing a canvas pair but I doubt I'll get them (Stuart Weitzman, $$$$... sigh). I think this outfit came out great and I'm glad you finally got to wear it! I'm impressed that you 1. kept the Lucky inspiration sheet for that long 2. recreated the look nearly a year later and 3. captured it so perfectly! I love the inspiration, but u paired the things better! ;) I love the whole look, especially the top and lovely skirt! LOLssssssssss you had me at your post's title, girl! Great outfit! Love the necklace and top! awwww, you like like you just stepped out of a lifestyle magazine page. so fresh. lol, that dog is a cutey by the way. Lovely outfit! I don't know what St Vincent isn't more famous (here in the UK, at least) because she's an amazing singer. lovely turqoise nail polish! I adore your lace skirt too! yessssssss!! this is 80's/90's fever at its best! floral+lace+oxfords are taking me back. This outfit is SOOO 2010. I kid, I kid. Defintely looks like its worth the wait! I love the bold floral against black and white. Also, LOVE the post title. I am wearing the same shoes, right now! This is a great outfit :) I may have to go look for a similar skirt. I think You have totally nailed this inspiration look! You look so lovely and your pup is so adorable! you seriously copied it perfectly. except I hate the word "copied" more like you made your own rendition. yeah I like that better. but really, you look fantastic. And is your dog as Bichon? he looks my dog! i totally remember that lucky spread because of bad planning i was on a five hour flight with only that magazine and skymall to read! anyway, your re-creation is amazing and i hope those shoes make more appearances because they are darling! Pretty pretty pretty! I love this outfit. Your shoes are perfect and that top is just the right amount of loose. I want to wear the exact same thing now! I am loving this outfit, and I'm saving it for my own inspiration. I just need a floral top! great skirt and such a cute dog! Those shoes were definitely worth the wait. The whole outfit is just fabulous. well look at you all cute and stuff. I am a Lucky girl and love the outfits they feature. Your outfit rocks my socks off. I commend your patience and determination! You pulled this outfit off FABULOUSLY! i love the little bird earrings! ha! i like the title :) :) i'm with you!!! Those oxford were definitely worth the wait!! Love that bright floral top with the lacy skirt!! You doggie is so adorable! Hehe, I love the title of your post. I spend too :) That's awesome that you were able to recreate this look a year later! I love it! I've recently fallen in love with Oxfords and it's taking every ounce of will power I have not to go order that pair right now! ooohhhh! love the bright florals with the lace. this is a great outfit! Wow, Lucky is getting hip, featuring St. Vincent! I can't believe you remembered the outfit!! I Love your version of it!! You look great - as per usual! !